Price List / how much does a marquee cost? It all depends upon what you have. Generally a buffet event is approximately £ 9 – £ 20 per head. Wedding vary from £ 20 per head to £ 35 per head, a good average is £25 per head so for 100 guests at the main reception £2500. We charge for what we supply. Seasonal discounts and package deals can be arranged, we have more scope when customers book entrance marquees, starlight lining and plenty of equipment. Marquee sizes generally increases in 3m size increments. We can go larger and longer. 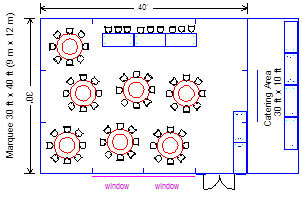 This is an approximate guide, it depends upon dance floor, stage, buffet area.